One of Cancun’s older resorts, The Royal Cancun (formerly the Club Internacional de Cancún) has a small footprint, is as tall as the palm trees (three stories) and is tucked into a quiet cove at the north end of the hotel zone. It may be compact, but with spacious rooms, each with its own kitchen, and a pretty beachfront sheltered by the island of Isla Mujeres, it will soon feel like home to visiting families. This long-time popular timeshare resort is part of the Royal Resorts Vacation Club (not be confused with Real Resorts) and has a high guest return rate. The well trained staff are known for providing loads of personal service, and the cooking and barbecue facilities tend to turn neighbors into friends. Along with the spotless and bright traditional rooms, we like The Royal Cancun’s family-sized villas. Each sleeps five to six people in a king bed, two singles and, if you need it, a double bed lounger in the living area. The villas have a full sized kitchen and dining area, a balcony, as well as cribs and babysitting services (on request and for a fee). For more traditional dining venues, the resort’s international restaurant, La Palapa is pricey but gets positive reviews. Families can save on their food bill by stopping in at The Royal Market, the in-house supermarket at The Royal Cancun, to grab the essentials for a meal in their suite’s kitchen. Accompanying their wide stretch of private beach, complete with island vista, the resort also houses two freshwater pools (and a kiddy pool too!) for families to enjoy. If you’d like to order drinks and snacks by the water, that’s fine — The Royal Cancun’s beaches and pools come equipped with a full service waitstaff. 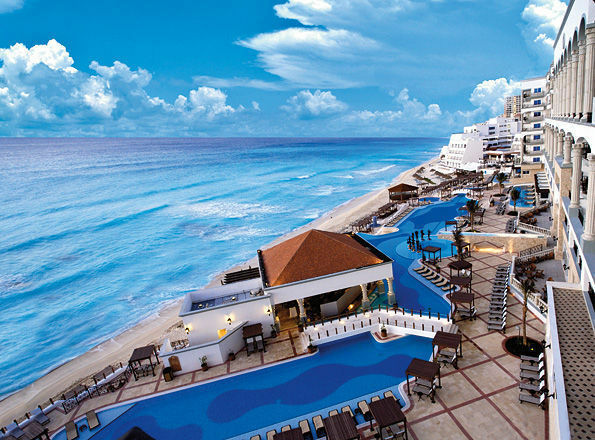 With some of the most family-friendly coastline on the island because of its protected location, warm water and shallow surf, The Royal Cancun is ideal for beach lovers with babies and toddlers. There are tons of in-house and on-site activities: tennis, snorkeling equipment, bikes, sailboats, boardgames, and more can be borrowed from the resort’s sports desk. At the Royal Cancun’s activities desk, families can arrange to take lessons in aqua aerobics, Spanish language or dance, crafts workshops, and other activities. Many of these sessions are kid-friendly, providing the perfect opportunity for some educational fun for the kids, with parents or while they’re enjoying a beachfront massage. Bad weather on your visit? We hope not, but just in case, The Royal Cancun offers Rainy Day programs, too. While there’s plenty to do at the resort, we urge you to get out and see the main Mayan sights. The Royal Cancun books excursions through Thomas More Travel and arranges day trips to Parque Nizuc (or Wet ‘n Wild Cancun), Cancun’s only water park, Xcaret, Cancun’s eco-adventure park, and Xel-Há, one of the world’s largest natural aquariums.